Its Christmas season again- the time to remember all your loved ones and make them feel special. But are you bored of the bland messages and cards that you have been using for so many years now? Looking for something new and creative to try? 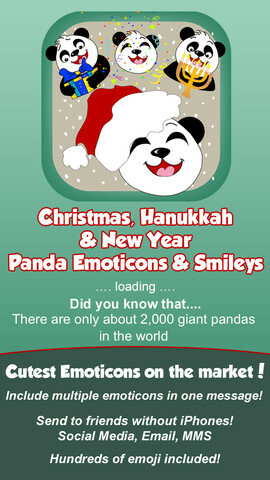 The iOS app Christmas, Hanukkah and New Year Panda Emoticons & Smileys + Emoji is what you should try this holiday season for a change. 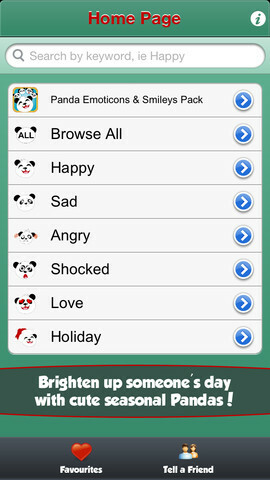 Wish your loved ones with exclusive seasonal adorable Pandas and messages with lots of Emoticons. 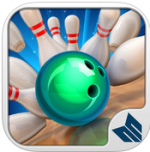 This app will help you express your care in a more fun and creative manner. 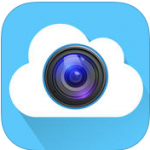 Most Emoticon apps and Emoji are too commonplace today. For this holiday season, you need something that suits the custom festive mood and goes with the theme of the season. This app will give you exactly that. And with this app, the limit of a single emoticon per message, which has been quite a source of irritation to emoticon lovers, is no more. 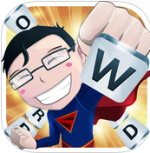 This app gives you the choice of including an unlimited number of emoticons in each message so that when word fall short of expressing your feelings, the emoticons will do so for you instead. Sending Christmas and seasonal greetings with this app is so much easier than conventional methods. You can post on the famous social networking sites or send an MMs or an e-mail to all of your friends. There is no issue with receiving them simply because they are basic graphics that just any phone can support. You do not need the best of technology to view them. 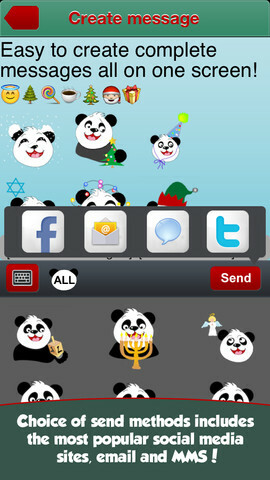 With Christmas, Hanukkah and New Year Panda Emoticons & Smileys + Emoji, you not only get Panda emoticons but also get all of the Emoji smileys with an Emoji keyboard. While the task of installing the Emoji keyboard might seem like a tedious one, it is really easy in reality. This is a fairly simple process that requires you to add the Emoji keyboard to your list of already existing ones in your Settings. With this, you can now make use of the Emoji keyboard on your cell phone. To avail of it, there is a button on the left hand side at the bottom of your keyboard. This is as simple as it can get. This app helps create awareness about giant pandas, of which there are just about 200 left in this world today, while also helping you greet all your loved ones. The user interface is very simplified and easy to work with. The range of smileys covers almost all the moods you can ask for. Also, the emoticons are very cute indeed.